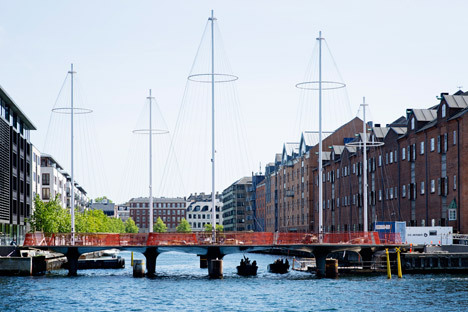 Danish-Icelandic artist Olafur Eliasson has developed a bridge spanning a Copenhagen canal, which functions a series of wire masts primarily based on ships’ rigging . 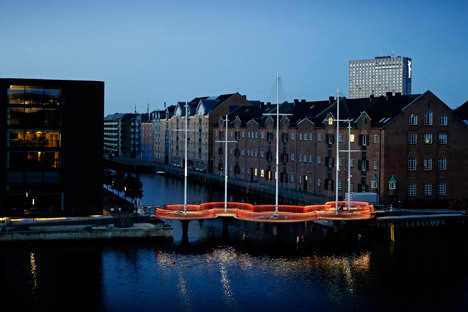 Opening these days, the Cirkelbroen (Circle Bridge) by Olafur Eliasson spans the Christianshavn Canal to connect the district’s Christiansbro neighbourhood and Appleby’s Square on either side of the water. The 40-metre-lengthy footbridge is created from 5 interconnected circular platforms. 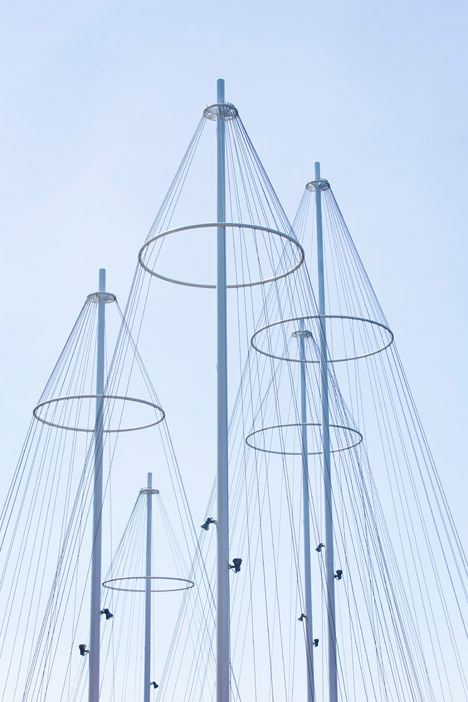 Each of the irregularly sized circles attributes a tall mast in reference to the boats that sail Copenhagen’s waterways. More than 110 tensioned wires are threaded among the base of the bridge and the tips of five poles. “While I was doing work on the bridge, I picked up inspiration from this place and it manufactured me feel of fishing boats from my childhood on the island,” mentioned Eliasson. “The bridge’s zigzag design permits customers to slow down and change their emphasis. It calls for a renegotiation of the public room,” he additional. 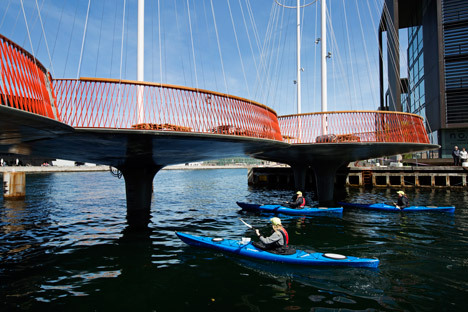 The central platform is articulated to let the bridge to swing back on itself, making a nine-metre gap for passing boat traffic whilst smaller sized boats this kind of as kayaks can pass under the elevated podiums. Red LEDs set in the balustrades illuminate the framework at night and are synchronised to flip on and off with the area’s street lights. Curving Brazilian Guariuba wood handrails are affixed to the leading of a crisscrossing arrangement of red railings. 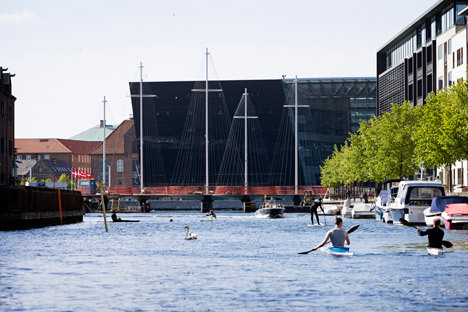 Cirkelbroen was commissioned by the Danish charity Nordea Foundation, which estimates that the bridge will be employed by around 5,000 cyclists and pedestrians every day. 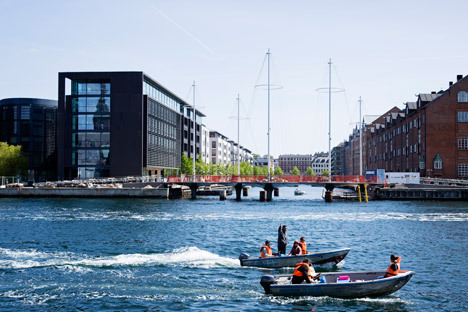 “Cirkelbroen helps make it less difficult for the men and women of Copenhagen to move close to the city,” said Nordea Basis chairman Mogens Hugo. The artist, who operates out of studios in the two Copenhagen and Berlin, also created the 2007 Serpentine Gallery Pavilion with Snøhetta’s Kjetil Thorsen. But Eliasson is best known for his immersive light installations that have been set up in galleries such as the Frank Gehry-designed Fondation Louis Vuitton in Paris and the Tate Present day in London. Photography is by Søren Svendsen and the Nordea Foundation.